Any Make or Any Model - Fixed. Lynch Computer Repair is complete one stop shop for all your laptop screen repair and support needs. We offer a reliable and convenient solution to all types of laptop display problems. No matter what brand of laptop you have, how old or new it is, we can fix it. Simply drop in to our shop during opening hours, you don't need an appointment. We will give you a free repair estimate there and then. 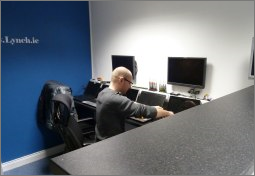 As we stock a wide range of screens, we can often replace your laptop screen while you wait. Why Choose Us for your laptop screen repair? We only use the correct OEM screen replacement part for your laptop. What does this mean? It means you won't find your screen going dark or the colours becoming dim over time. All Screen's Come with 1 YEAR WARRANTY. 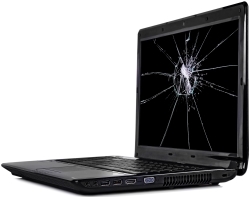 We will use the correct parts to repair your laptop screen, not the cheapest replacement available. Many cheap replacement screens will become dark over a short period of time, meaning you would need to turn the brightness up to full in order to see the colours and detail ect, which can be harsh on the eyes and also demanding on your battery. We will use the correct part so your laptop will look and feel the way it was when it came out of the box. *Estimated and not guaranteed. Delays outside of our control may extend the time it takes to repair your laptop screen.